My submission for saignée‘s inspiring 32 Days of Natural Wine event, found here in its original form. Go read it there, and then read everything else in the series. You’ll be a better person afterward. Paris may not be the heart of the natural wine movement… that and all the other vital organs reside in the cellars and the regions whence the wines emerge…but it’s almost certainly the head. It’s got a critical mass of consumers, from enthusiast to hipster (and wannabe-hipster), and a vibrant commerce that serves that mass. Natural wine nirvana, right? In a sense. If there’s a bright, or even popular, future for natural wine, Paris is what it looks like in its ascendance. One can revel for weeks – perhaps even months – in the unsulfured and unyeasted with the right list of purveyors and a fat carnet, or at least sturdy shoes. Except…I did that. Ate, drank, cooked, and shopped as naturally as I could. And the shocking (to me, anyway) takeaway was that I found it a little boring. What’s more, it made me realize something: not everything is lit with rosy natural light in La Ville Lumière. There are some shadows lurking on les routes ahead. This is going to require some explanation, I suspect. What can destroy a wine category these days? Lack of quality, certainly, but this is a slow actor; the general unsaleability of Mâcon or the turning away from Tuscany didn’t happen overnight, but over decades. What can kill it a lot faster, even from a position of apparent desirability, is the reality or perception of over-uniformity. Of externally-enforced conformity. Of cynical boredom. By way of example: remember when muscular Australian reds of both gravitational and evaluative endowment were the point-laden rage? Notice how, just a few years later, one can barely give them away? There’s more than one factor at work in that Icarian tale, but a major contributor is that the thermonuclear fruit devices that were so lauded by critics and consumers are available from just about everywhere on the planet (including Australia) at a much lower cost than those paragons of pricey (purported) pulchritude. Now, let’s be honest. There are those who drink for predictability. Who – though they would probably object to the metaphor – crave a certain McDonaldization of product, in which consistency and the comfort of the familiar are atop the pyramid of virtues. Rather obviously, those folk aren’t buying natural wine. At least not on purpose. The market that rejects the standardization of industrial viticulture and outcome-oriented winemaking is, by definition, counter- and anti-. This market seeks sensation, but the sensation it seeks is that of authenticity, of difference, of deviance. Among the principal appeals of natural wine are its unfamiliarity and unpredictability. Both of which are, as they must be, measured against the norm…which is, in this case, traditional (which is inclusive of, but not of necessity, industrial) wine. Without that contrast, much of what is unfamiliar and exciting about natural wine is decontextualized. 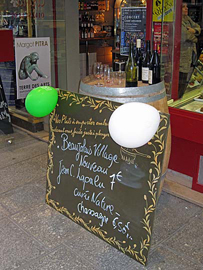 My somewhat leisurely encounter with Paris’ natural wine scene delivered a lot of sensation, difference, and authenticity. No question. But viewed through the contextual lenses of time and post-facto consideration, it delivered something else. It’s not that any given wine demanded this reaction. Mostly, I drank very well. Extremely well, actually. I could have gone many more months without repeating a libation, without going back to something a second time (though that did happen once, for which I must blame Jean Foillard’s uncanny skill with Morgon), without being forced to act not as an eager dabbler on the frontier, but rather as an actual wine consumer stocking up on quantities of favored bottles. That’s the wonderful breadth of potential natural wine experiences that Paris provides, and it’s unquestionable that had I been in Paris long enough, I’d have had the opportunity to develop a deeper understanding of wines that were otherwise no more than ephemeral dalliances. There’s great value in that, for sure, and I look forward to suffering that burden in the future. No, it was the commercial face of my natural wine crawl that brought on the ennui. Wine bar, store, restaurant…wine bar, store, restaurant…wine bar, store, restaurant: the same list, the same selection, the same labels. Almost without fail. The immediate objection – why is this bad, exactly? aren’t most of the world’s wine collections the same boring and industrial (or at least traditional) wines, over and over? – is both taken and acknowledged as correct. Yes, the sin of boredom is committed so much more frequently outside the natural wine world that it hardly bears mentioning inside it. But the special thing about Paris’ genre concentration is that it previews the consequences of a triumph of the alternative. And in that triumph is born a redundancy that looks an awful lot like all the familiar redundancies. I’d like to see natural wine avoid that fate. The problem is self-segregation. Natural wines have…by the deliberate choice of their selectors but also by a somewhat surprising inertia…ghettoized themselves into a self-referential niche. It’s a reasonably successful niche, and the marketing advantages probably go without saying, but a niche it remains. I know there are some who prefer this state of affairs – there’s your alternative music analogue writ vinous, in which the magi of secret knowledge tremble in fear of the moment in which their favorite becomes known to The Other – but there is also a legitimate argument against this preference. In various cities around the U.S., cities in which natural wine is decidedly alternative and hard-to-find, there are a few stores, wine bars and restaurants to which one goes to be guaranteed a selection from the genre. There might, for example, be just one “natural wine bar” in an otherwise wine-soaked metropolis, or a sommelier whose iconoclasm is rewarded by a dedicated but niche fandom. In that situation, rigid orthodoxy is a marketable virtue, and should neither be gainsaid nor challenged. In such locales, rigidity of concept is a virtue. But in Paris, where it would seem to be thrilling that there are considerably more than a handful of such establishments, the effect is somewhat different. The wines are no longer hard to find, for the interested. What they are, instead, is gated within a neighborhood of like-minded peers, largely unchallenged by dissent from within or without. It’s an oeno-epistemological closure that just can’t be good for the category. “Well,” one might ask, “why not?” Given that both the old and the modern ways have been dominant everywhere and everywhen, shouldn’t natural wines be allowed their own time in the sun? (Or rather, their time in a humid, slightly chilly environment in order to avoid the much-feared instability allegedly inherent to the genre?) Wouldn’t it be better if even more establishments went au natural? That may be an impossible dream, since natural winemaking doesn’t necessarily scale all that well. Sure, OK, I get that. But if there are a lot of natural wines (and ideally, as time passes, there will be more), why not spread the wealth a little? Why not some intrusions into enemy, or at least unfamiliar, territory? If there’s a reason one loves natural wine – whether that’s taste, philosophy, or something else – then it’s hard to understand a lack of desire to see that taste/philosophy/etc. exert influence outside the fold. It’s great to welcome a new addition to the natural family. But wouldn’t it be more valuable if, say, Villa Maria abandoned inoculated yeast thanks to the influence of natural wine? If, for example, Drouhin and Jadot massively reduced their use of sulfur? If Wolfberger decided against chaptalization? No, it’s not a clear path to perfection, and the wines still won’t be “natural” by anyone’s definition. But the perfect – as the cliché goes – must not become the enemy of the good. Progress is preferable to the alternative. That said, I don’t think industrial wine can go away. Nor should it. The demand for crushed grapes outstrips anything the natural set can provide, and especially so if I don’t mistake the generally anti-corporate inclinations of those in the natural wine cohort. Traditional wine can’t (and won’t) disappear, either. But I’d love a wine world in which the two éminences (pinot) grises were not the entire story, and in which natural wine was more than a brief appendix…or worse, a screwily-fonted footnote. To expand to chapter form, natural wines are going to have to expand the range of their thought and worldview. They’re going to have to deal with their competition. Face to face, vino a vino. It’s easy to miss that they’re not doing this. Are you a Beaujolais booster? A Loire lover? A Jura junkie? You – and I – are in luck: the best of the appellation could very well be represented on the natural wine shelf. But what about Irouléguy? Bandol? Burgundy? The Rhône? Bordeaux? My own personal oenopiphany of ennui occurred, I suspect, because I’m an advocate of Alsace. Now, it must be acknowledged that not many natural wine folk share my enthusiasm for the region. There are various and entirely supportable reasons why, and the whole “natural” ethos is just one of them. That said…looking at what’s on commercial offer within the category, who can blame them? Aside from Barmès-Buecher, the offerings are wildly inconsistent at best, and too often downright wretched at worst. And so, in store after bar after restaurant, the same labels appear. The same, awful wines. Or maybe the good stuff, but in any case that good stuff is still identical to the good stuff at the last place. And the place before that. And the place before that. Worse, in no sense are the pinnacles of the appellation – the benchmarks that define that potential for a region – represented. Alsace is hardly alone in this, but it is (for me, as a self-professed fan) a convenient stand-in for the complaint. Herein resides the gnarly core of the problem. It’s not that I care that much if Boxler, Weinbach, Josmeyer, Trimbach, or whoever one wants to name as their flûted standard-bearer is available in a given venue. But when they’re not available in any of them? And when the natural alternatives are similarly absent in the non-natural establishments, for reasons I dare not guess? I don’t want to overstate this as vinous apartheid, because that would be an abrasive and confrontational step too far, but it’s a separation that need not be, and the wines as separately-presented are most definitely not equal. To answer this: it’s mostly not (there are always exceptions), and the winemaker is being needlessly defensive, but he’s also expressing a widely-held opinion. What’s more important is that it’s a reflexive and resentful feeling that need not be. When natural wines self-segregate, they require the argument for their quality to be conducted solely with words, with philosophy, and with rhetoric. This is, necessarily, unequal to the task. Were the wines physically coequal with their otherwise-identified peers in the marketplace, the dialogue wouldn’t be one carried out in the strident, bickering, posturing tones of blogs, web fora, and print, but by the character and quality of the passion represented by each bottle. The wines would, perforce, speak for themselves. And isn’t that what natural wines should do? Isn’t the fundamental philosophical purpose of natural wine to express without mask or interpretation? Without interlocution? Without filtering? The Paris of my desire – and the stay will be longer next time, and much longer the time after that – should not be a carefully-constructed list of naturalia with GPS coordinates and hours of operation. It won’t be a parallel universe. It won’t be a matter of choice, of division, of convention vs. dissension. In my idealized Paris…and eventually, elsewhere…“natural” will no longer be separate, only, and first. It's amazing how threatened some folks are by the different practices of "natural" winemakers. The owner of a 200K+ case winery in Livermore took time out of the tour she was giving to insinuate that biodynamic was not as good as The California Wine Institute's "Code of Sustainable Winegrowing Practices," because biodynamics doesn't deal with the whole environmental impact, such as erosion.